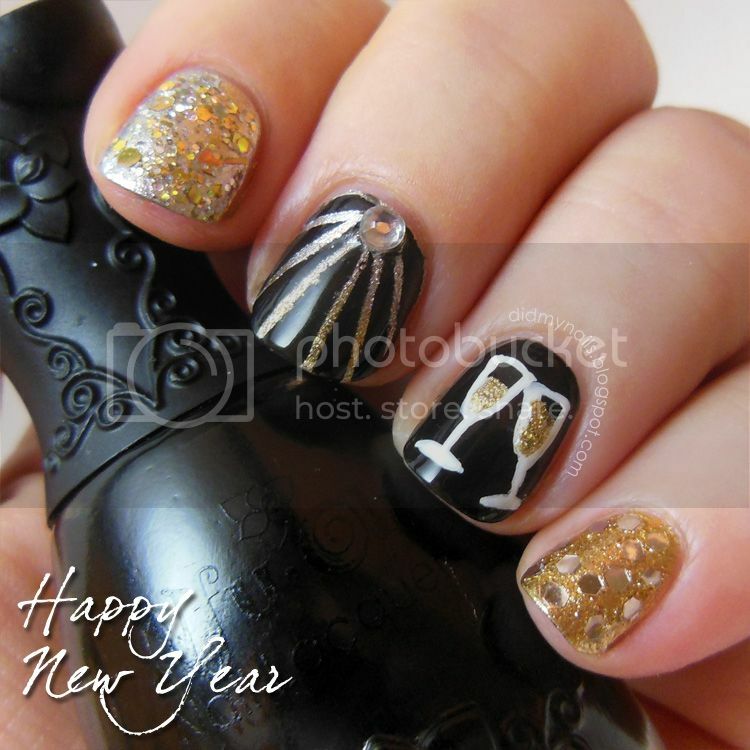 Just a little over-the-top fun for New Year's Eve! I couldn't really decide on what exactly I wanted to do with my nails for New Year's Eve, so I skittled 'em with a little bit of everything. My pinky nail is Zoya Ziv with silver glequins from BornPrettyStore, and my ring finger is Nfu Oh 132 (black) with Orly striper champagne glasses (and Zoya Ziv champagne). The middle finger is a gradient of Orly Dazzle (silver), OPI Designer...De Better! (champagne silver/gold), and Ziv. Then, unable to leave well enough alone, I used some striping tape to make "laser" lines and--at this point, in for a penny--topped it off with a rhinestone. My index and thumb are actually my favourites; hindsight, I'd pick one of them for a great, festive, sparkly look on its own, but I am outta time before the evening starts! So, the index is Orly Dazzle again, topped with CrowsToes Maxxed Out (again, love!). 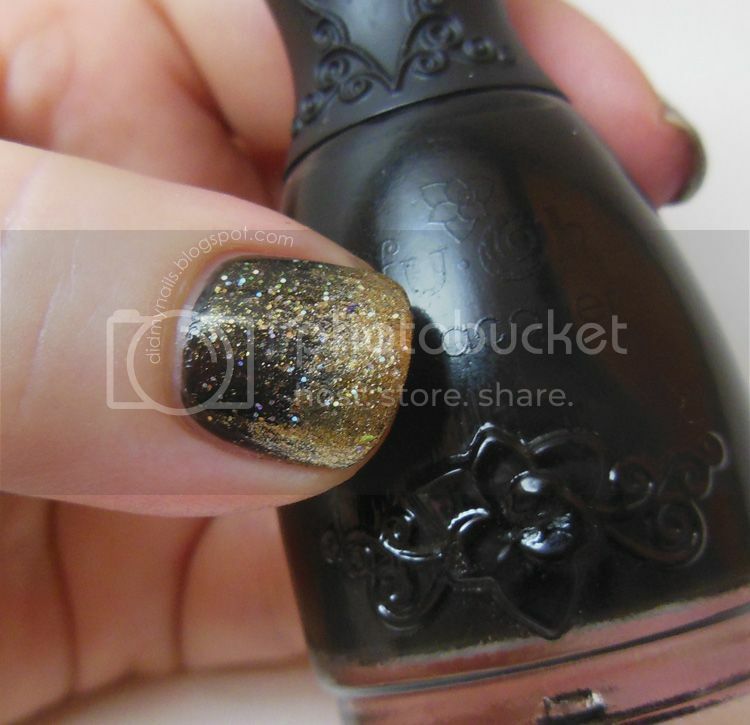 And for my thumb, I did a gradient in black and gold, Nfu Oh and Ziv, with a top coat of Revlon Gold Jewels. As the year closes out I'd like to say a huge thank you to everyone who has stopped by, everyone who has commented, everyone who has followed Did My Nails! These past few months have been a total blast, thanks to the wonderful people I've met through this great hobby, and I wish every one of you a safe and happy New Year's Eve...and a fabulous 2013! With my nails growing out, I thought it'd be good to paint them a nice, dark colour because when they're this short and I paint them something too light, they make me think of Chiclets gum. My first thought was to go with Zoya Storm, from the new Ornate Collection, only I don't have that one. Minor detail, there. I did however find something in my untrieds that I thought might be similar, a Sasa bin purchase from late summer called Docile D224. I bought it for a few reasons. One, I liked the schmancy bottle it came in. Two, I hadn't seen a black polish with such dazzling holo sparkles in it before (this was long before Storm came out). And three, the brand name "Docile" amused me. So, not so much with the holographic sparkle. When I first applied it, the holo was really bright and dazzling, and I was all kinds of excited about my excellent cheapie find, but then when it dried, the sparkly bits kind of settled into the base. I thought it might be just the first coat doing that, but the same thing happened on the second coat. And then again, when I applied my top coat, the holographic particles perked right up again and started shining through all brightly, but as it dried once more, most of the shimmer settled down again and got all...well, docile. It's still a nice black, and interesting with that hint of holo shimmer to it, but from arm's length that part's all but invisible. Still, I think it might make a good background polish for some galaxy nails. And now that I think about it, it might look pretty cool with a flakie polish on top. Something to try next time! Back in town after a fantastic Christmas trip to Japan! Had a great time, but sadly, my nails decided to maintain their holiday tradition of breaking when I travel. Breaking badly, in fact. Three different times. So now they're all kinds of short and barely shape-able, even. Le sigh. I didn't feel like painting them at all after I got home, but then I sat down to watch the Doctor Who Christmas Special...roll the opening credits, roll an idea I could not wait to try. 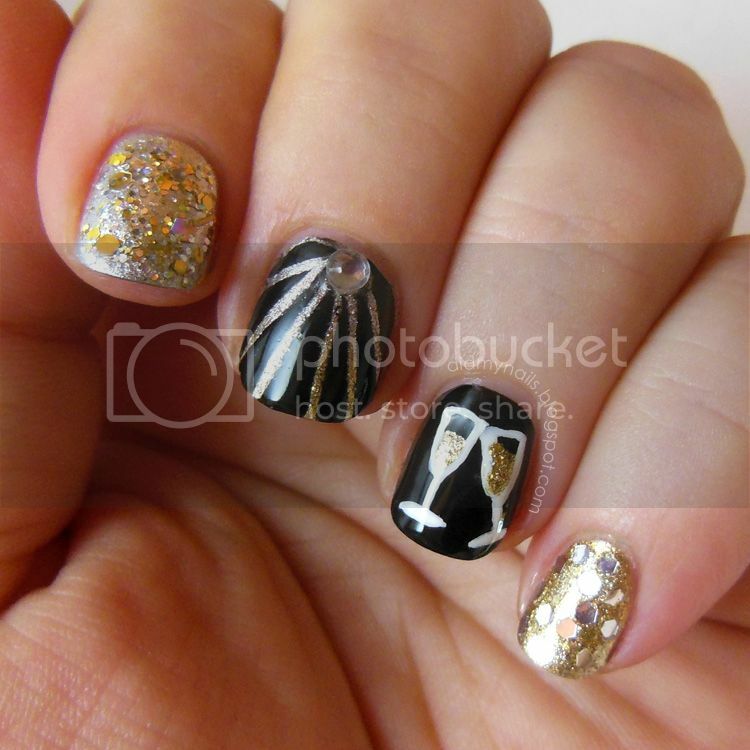 Nail art from Doctor Who, The Snowmen! The base is China Glaze Blue Bells Ring, and my ring finger is OPI My Boyfriend Scales Walls, roughly sponged over with Zoya Dove, Orly Decades of Dysfunction, and Bandi Snow White. The snowflakes and Snowman face are Orly nail art stripers. Those tiny little lines were really fiddly to do, but the Orly stripers have a nice, fine tip that helped a lot. I can't stop wishing I'd had longer nails to do these on, but they should be back to fighting shape in a couple of weeks...I only wish we had that short a wait for the next half-season of Doctor Who! Hope everyone had a wonderful holiday week--I'm really looking forward to catching up on all the posts I missed while I was away! Merry Christmas, everyone! Today's TT theme is, you guessed it, Christmas! Oh, boy howdy...I literally have 32 minutes until I leave for the airport, so with apologies, please to be enjoying some very hasty pudding! When Husband and I went to see The Nutcracker a few days ago, they brought this huge Christmas pudding out during the party scene, and I immediately thought, "Ooh, I gotta put that on my nails!" Unfortunately I neglected to think, "And I shall leave ample time in doing so to attend to details like top coat and cuticle clean-up before I have to leave town." I do have time, though, to be sure to add a huge welcome to our newest Twinsie Tuesday member, Jamie of Polish, Please! and to wish everyone, once again, a very Merry Christmas! One more Christmassey (Christmas-y? Christmish? Three words in, and I'm befuddled by an adjective). Ahem, starting over. 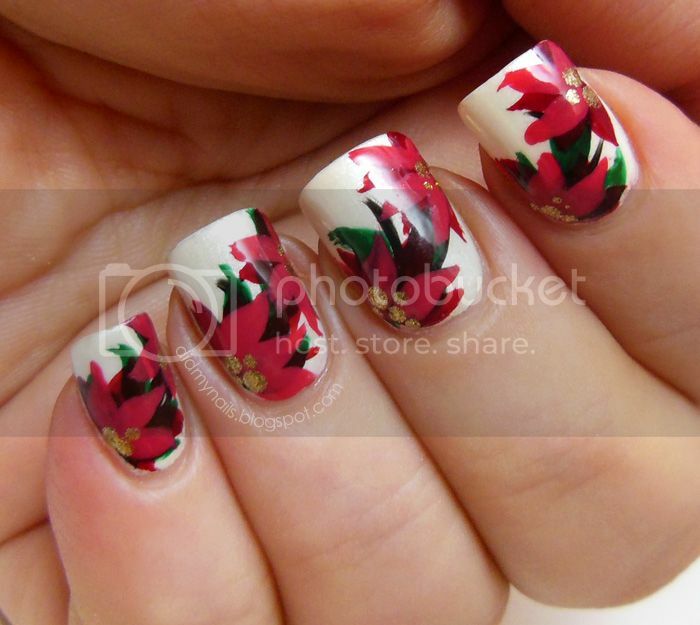 One more Christmas design before the big day, and for this one I decided to stretch myself a little and try painting some poinsettia nails! Drawing from a Robin Moses design and having next to no idea what I was actually doing, I pretty much grabbed some polish and a paintbrush and had at it. The base is Bandi Snow White with a coat of Orly Au Champagne on top to soften it just a bit. After that I did a few basic, background swooshes of black, then some Bandi City Green leaves, followed by dark red petals of Orly Grave Mistake, then a mix of reds for the lighter petals, finishing with Zoya Ziv dots of gold. I've done flowers lots of times before, but this is the first time I've taken a paintbrush and actually "painted" something, instead of using dotting tools or nail art stripers. Of course, being my toughest critic I'm all about seeing the flaws, but I can also say that it certainly turned out better than I'd have expected from my first real "painting" attempt. So, something to build on, yay! As I've mentioned, my posts this week have been scheduled ahead of time, and I apologize for not being able to check in on everyone's blogs while we're away. I hope everybody's having an amazing week, though, and a very Merry Christmas! I got a package a few days ago from the beautiful Tara of Polishy of Truth that made me squee with giddy delight. For no other reason than the fact that she is made of awesome and rainbows, she sent me CrowsToes Her Goose Got Cooked! It should come as a huge surprise to absolutely no one who knows me that I totally, totally love it. Her Goose Got Cooked is from the CrowsToes Christmas Crow collection (and is a Llarowe exclusive). This gorgeous mix of orange, gold, and pink glitters is simply genius, somehow managing to be at once soothing yet bold, soft yet fiery. And like the other two CrowsToes polishes I've tried before, the intensity of the reflective, holographic sparkle is simply amazing. I wore Her Goose Got Cooked over a layered background of OPI Pedal Faster Suzi on OPI My Very First Knockwurst. I'd say it's about 2 coats of glitter, applied by dabbing the brush lengthwise down the nail, then going back to fill in here and there. I worry I probably sound all broken-record when I rave about CrowsToes glitters, but every one I've worn has been fabulous. I came so close to buying this one when I ordered my others and was kicking myself later for not pulling the trigger. Thank you so much, Tara, for a wonderful surprise! For months, ever since I started playing with nail art, I've been looking forward to trying some fun Christmas tree nails, and it's finally the season! The week, even! I was fortunate to receive two new items from Born Pretty Store to review, and I'm really pleased with how they worked together with this design. Details and more pics to follow, after the break! This week for Twinsie Tuesday we're doing our birthstones. I'm a March baby and was all set to do something in a pretty, blue aquamarine when I discovered that I apparently have another birthstone out there, the bloodstone. I'd never even heard of it before, but I kinda like it! I also like that it looks sort of grunge-Christmas-y, so I decided to see if I could manage something similar. So...sort of? Maybe? A little bit? I started with a base of China Glaze Agro, then sponged on Essie Going Incognito before switching to saran wrap to add some swirls and dabs of China Glaze Def Defying, as well as more of the first two...and also a tiny bit of random brown because why not. The red is a blend of Revlon Fire and OPI A Roll in the Hague, which I applied with a dotting tool. All in all, I can't decide how I feel about the end result. One second I love it, and then the next I'm fighting the urge to start over and try again. Even if I didn't quite nail it, though, I had a great time trying something new, and I'm looking forward to seeing how the other Twinsies interpreted their birthstones! 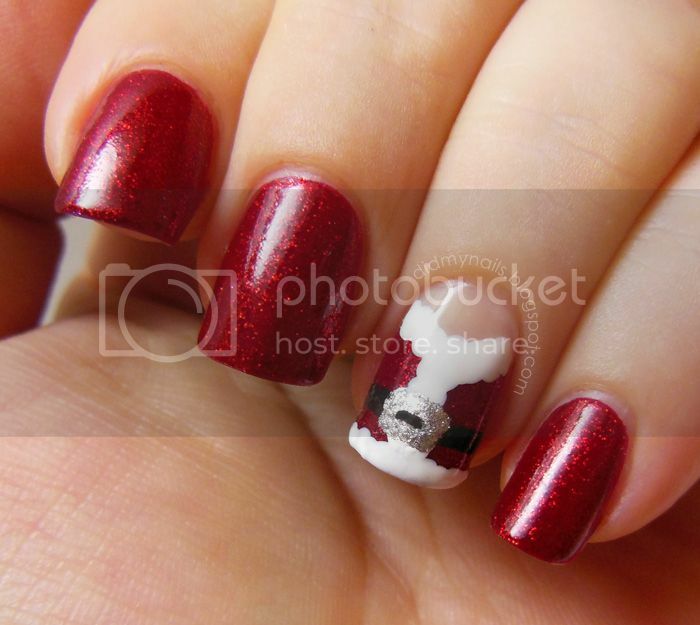 And now, here's the third of the three tutorials I did for Sassy Hong Kong, Santa suit nail art! 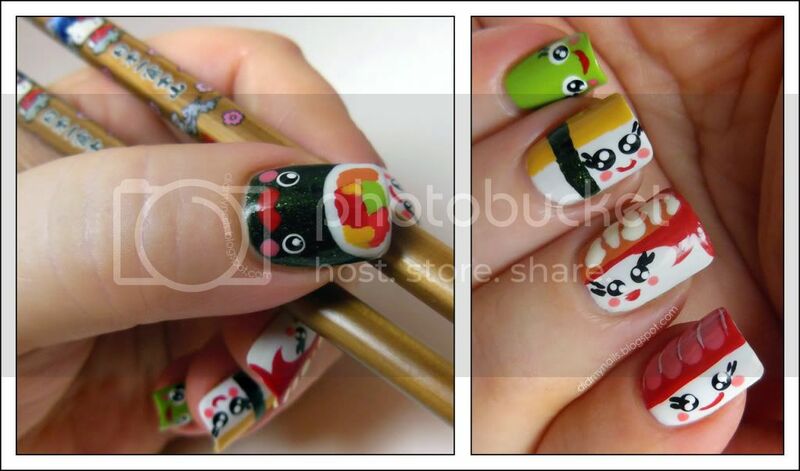 You can certainly do this one on all your nails, but I like this particular design on just one, as an accent nail. The process is a little bit more involved than my last two tutorials, but the individual steps aren’t any more complicated than dots, a sticker and a stripe. Once again, instructions and pics after the break! 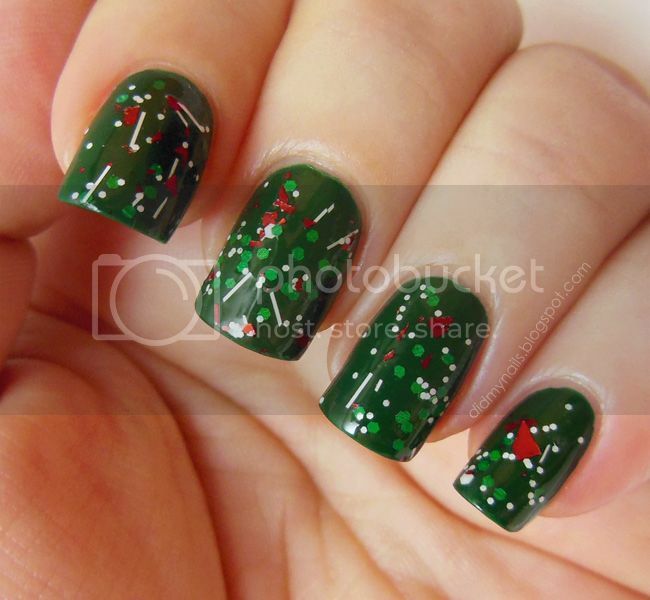 Today I'm happy to post the second of the Christmas nail art tutorials that recently appeared on Sassy Hong Kong. This is a slightly less intricate version of the snowflake nail art that I posted a little while back. I still think it's really cute, though, and a great tutorial for beginners. Step-by-step, with pictures, after the break! 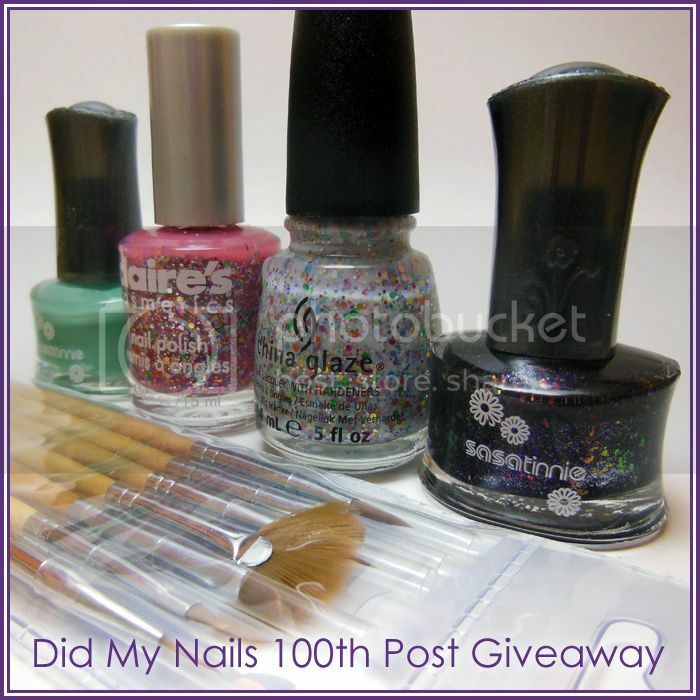 Just a quick post today to announce that Infinity Shp has won the 100th Post Giveaway! Congratulations, and so many thanks to every single person who visited and entered. And a big welcome to everyone who has recently started following Did My Nails! 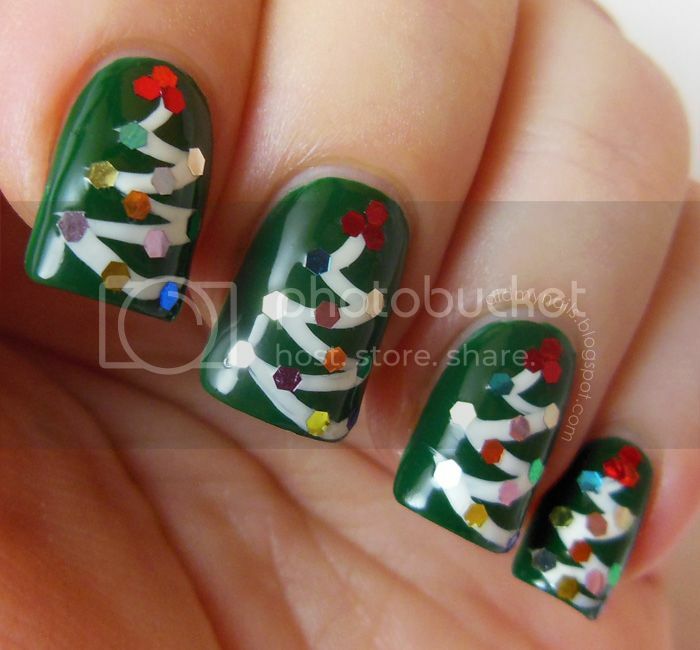 'Tis the season to deck the nails! 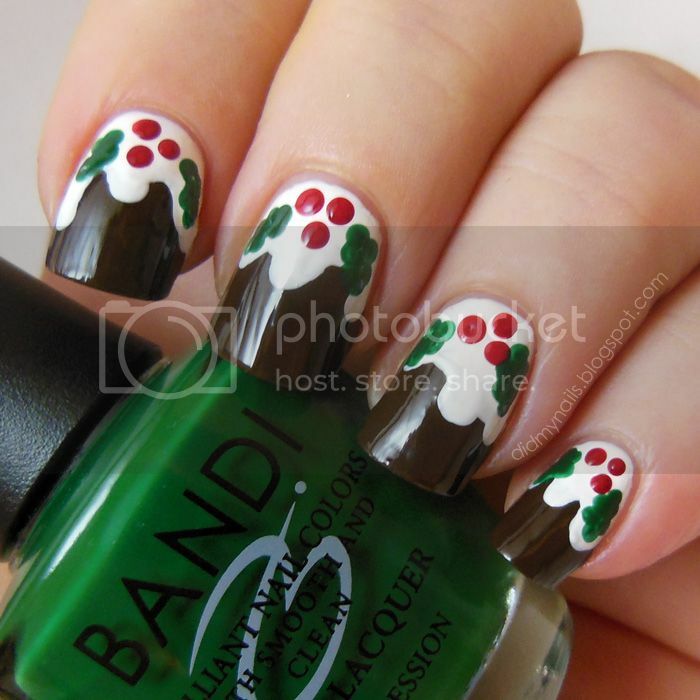 Once again, Rach invited me to do some tutorials for Sassy Hong Kong, this time some nail art designs for Christmas. 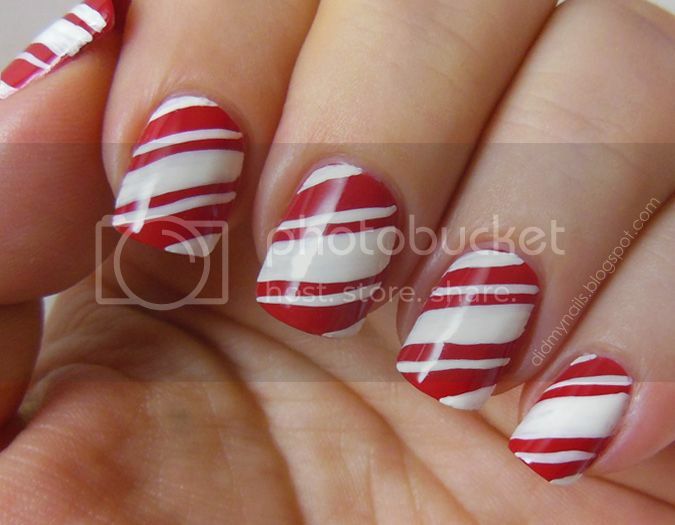 If you want to see the whole kaboodle, they're posted together under DIY Christmas Manis, but I'm going to take them one at a time here, starting with some fun and simple candy canes. Step-by-step pics and easy instructions after the break! The theme for this Twinsie Tuesday is Chanukah, and I hope all my Jewish friends and readers are having a wonderful week, celebrating the Festival of Lights with friends and family! I had all sorts of ideas for things to do for this manicure, but somehow they just weren't translating quite right to my nails. Any fancy nail art skills just up and deserted me, so after a couple of tries that didn't do justice to the theme I decided to scale back and go with something simple but fun. This was my first attempt at the cloud-tip design popularized by Nailside, and I was pleasantly surprised with the results! As Jane illustrates in the tutorial I linked to, you don't need any tools at all to create this design; it's all done with the polish brushes themselves in just a few simple strokes. Genius! 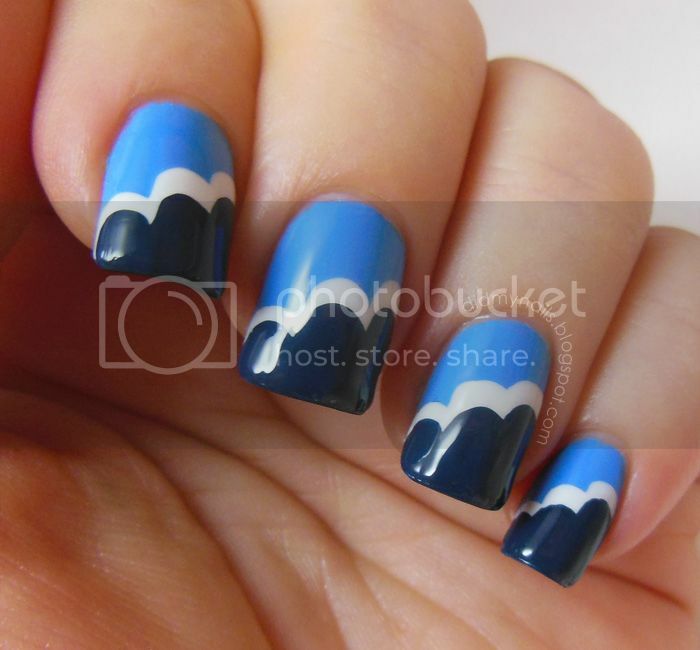 Given the theme is Chanukah, I chose some pretty blues and my go-to "white" for these clouds. Above and below OPI My Boyfriend Scales Walls, I used two Revlon Colorstay polishes, Coastal Surf and Midnight. I'm still just a little disappointed that the candles I'd wanted to do this week didn't cooperate, but I really like this design. Looking forward to trying it again soon, as well as to seeing what the other Twinsies did for their Chanukah-inspired manicures! I'm a guest today over at The Blahg! Sharra is awesome and sweet and funny and has fabulous taste in books (Sir Terry Pratchett FTW! ), and I was very happy to pinch-hit while she's prepping for exams. Thanks to Miss Rainydays for the tutorial, and for more, check out The Blahg! This is what I had planned to layer over Zoya Ziv, and I love it. It's CrowsToes Maxxed Out, from the 2012 Holiday Collection. Did I mention that I love it? 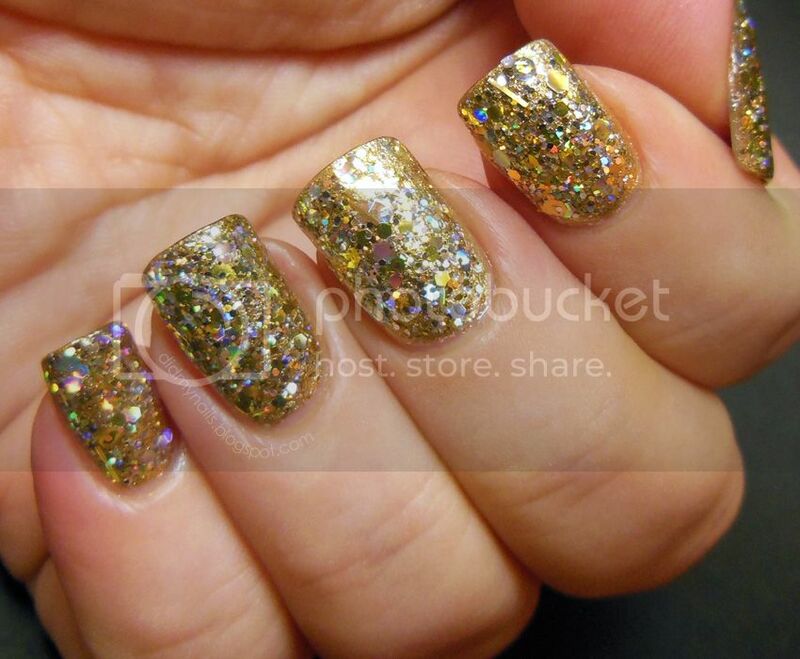 Packed with holographic, sparkling gold and silver, Maxxed Out is a perfect, festive glitter for the holidays, New Year's Eve, an evening out...grocery shopping... (that was the first place I went with it on, and my cashier was totally wowed ;p). It's also one of those beautiful polishes that's hard to do justice in pictures because the flashes of holographic colour are just so intensely gorgeous. They glint and gleam as your hand moves even the tiniest bit, even in quite dim lighting! I thought black might make a good background too, so I did a few of both. More pics after the break! I've been searching a long time for the right metallic, gold polish, and I think I may have finally found it! We haven't known each other long, but I think Zoya Ziv and I are going to be very happy together. Beautifully metallic, from the Zoya Winter 2012 Ornate Collection, Ziv is a foil polish that's not too yellow or brassy, which is my usual problem with golds. In general I greatly prefer silver or white gold shades, but there's just enough of a champagne-ish lean to Ziv to soften the tint while still keeping it firmly in the "true gold" category. There are also... and I was surprised by this... some flakes of what looks like copper dusted throughout. My theory is that they're the trick to this awesome alchemy, warming the softer-hued particles without the need for a brighter yellow. For today's "black and white" Twinsie Tuesday theme, I (and I suspect several others) took that to include all the greys in-between and experimented with a mixture of water marble and dots on my nails. My index and ring fingers are OPI My Boyfriend Scales Walls dotted over China Glaze Recycle, and the others are...well, they're several. After a base of Zoya Dove, I did some vaguely flower-shaped water marble swirls in Dove, China Glaze Elephant Walk, Nfu.Oh 132 (black), and a little bit of Boyfriend Scales. The two designs were interesting against each other, kinda cute, but it wasn't really a cohesive look. Then I added the flowers and extra dots to pull them together, and BLAM, I loved it. Hated taking it off too, so I'm definitely going to do this again, in just about every colour combination I can think of. Yep, it's a pretty short post today (at least for me)! 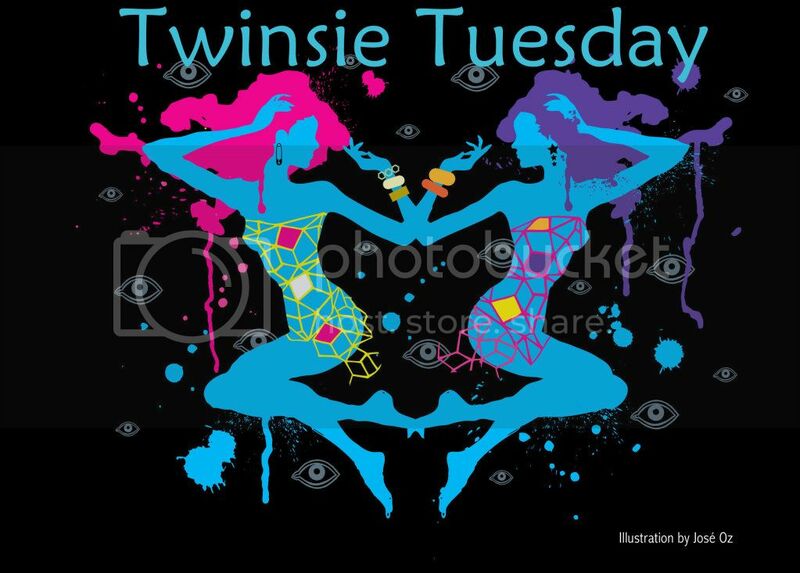 For any who'd like to enter, there are about 9 days left in my current giveaway, and for more black and white manicures, please check out some of the other Twinsie Tuesday blogs! It's the most wonderful time of the year! The mall downstairs is decorated with greenery and bows, the buildings downtown are covered in light displays 20 stories tall, and I can finally leave my windows open without turning the apartment into a discount sauna. Truly a Christmas miracle! Now that we've hit December I'm ready to break out some holiday nails, starting with Merry Mistletoe, a glitter topper from Twenty Seven Polish. This is about a coat and a half over Bandi F706, City Green; I applied one coat of Merry Mistletoe as usual, then dabbed a bit over some spots to fill it in just a little, rather than apply a full, second coat. Merry Mistletoe isn't as dense as most indie glitters, which I think works in its favour. I really enjoyed all the colours and shapes in it, and with this slightly scattered application, they show up nicely against the deep, green base. 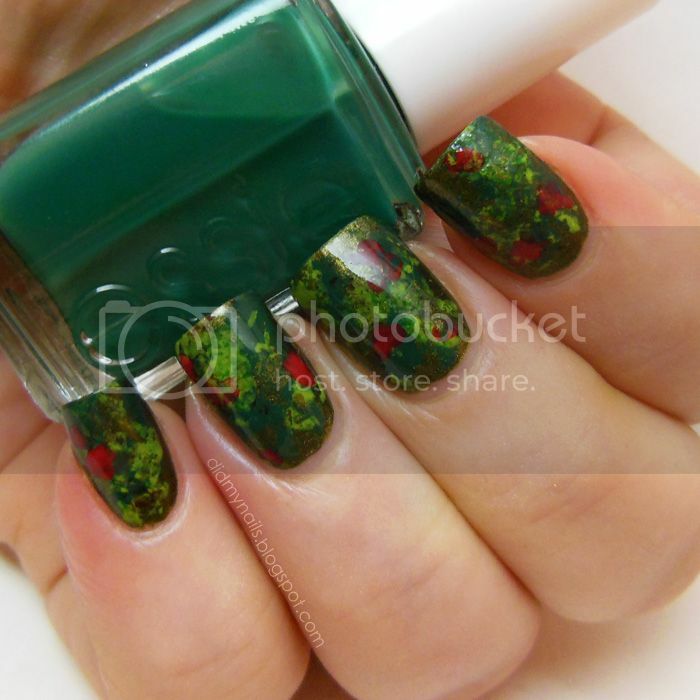 Merry Mistletoe contains several types of matte glitters. There are medium green hexes, small white hexes and bars, and bright, beautiful shards of red. As a general rule, I don't like bar glitter, but I think it works well here, making Merry Mistletoe just that little bit more festive and contrasting nicely against the other shapes without pulling too much of the focus. I love it with a glitter comes together! I spent months oohing and ahhing and totally fangirling over swatches of CrowsToes polishes before I finally placed my first order through Llarowe, for Absolum and Frogs' Breath. When they showed up I gave myself this pep talk about not setting my expectations too high, telling myself I might have to wait until they were applied and in the sunlight or my light box before I really saw the same sparkle and brilliance I'd seen online. Then I opened the package...Y'all, I squeaked. Long and loud. I fully assume that dogs on the other side of the harbour were whipping their heads around all, "What was THAT?!" This is two coats (one regular, one dabbed) of CrowsToes Frogs' Breath over OPI Don't Talk Bach to Me. I chose this mustard-lime shade, hoping it would compliment both the green and the gold in Frogs' Breath while still offering some contrast, and I think it works. I never know if I'm choosing the right undies to show off a glitter at its best, and there is so much best to show off with this one! That sparkle I was hoping to see? In spades. Giant, heaping spades of sparkle and colour and holographic brilliance. I am officially smitten with CrowsToes polish. I have been literally stunned by this gorgeous, gorgeous glitter. I am so excited to try Absolum now, just as soon as I can decide what polish to pair it with, and there's an envelope on my couch that I'm waiting to open until I finish my "to do" list for the day (item: obligatory giveaway mention? check!). It should contain Maxxed Out, from the CrowsToes Christmas collection. Local canines, consider yourselves warned. Many thanks to Mercedes for having me as a guest at Beyond Beauty Lounge! I did one of my favourite techniques for this post, a saran wrap manicure, along with a little bit of how-to. I'm a touch late in posting about it here because my last post kinda had a specific slot it needed to occupy (100th Post Giveaway, y'all! ;p), but for more, please check out Beyond Beauty Lounge! This giveaway has ended. Many thanks to everyone who visited and entered! 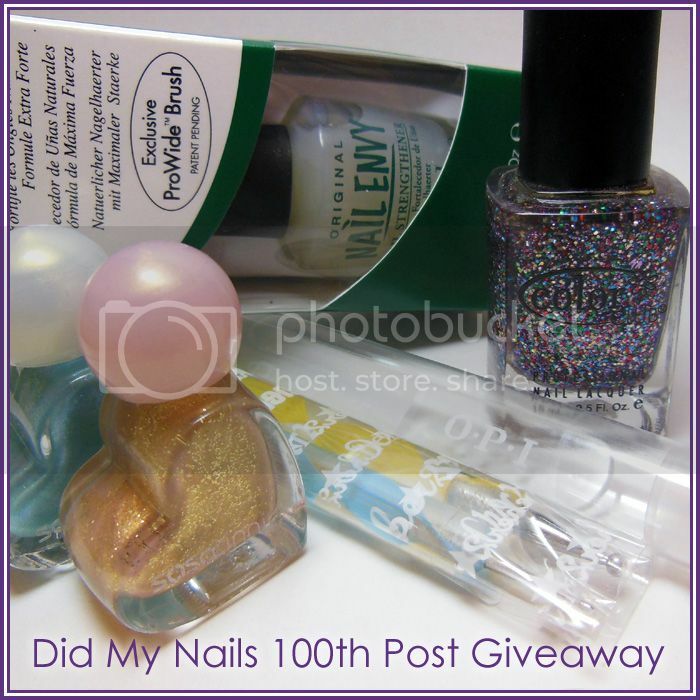 Today marks my 100th post on Did My Nails! I wanted to do something fun to mark the occasion, so I'm having another giveaway to say thank you very much to everyone who has stopped by, maybe left a comment, even decided to follow. I've said before that I'd probably still be doing this, even if it was just me looking at pictures and remembering that time I did that thing, but having you guys drop in makes it so much more fun. Sincerely, thank you very, very much! And yes, words are nice, but so is free stuff, so without further ado...the goodies! I couldn't decide on a giveaway theme, so there's a little bit of everything (and much of it sparkly). Polishes included are China Glaze It's A Trap-eze!, Color Club Wish Upon A Rock Star, Claire's Candy Shop, 2 Sasatinnie polishes (teal green and FCGL002, the Orly Fowl Play dupe I posted about here, 2 Sasatinnie minis (gold and lt blue shimmer), and OPI Nail Envy Base Coat. Also, in addition to the polishes, I'm including a set of nail art brushes, a pair of dotting tools, and an OPI crystal nail file. As before, this giveaway is open internationally, and there are just a couple of requirements to enter. One, be a public blog follower of Did My Nails via Google Friend Connect (GFC). Two, please leave the best email address with which to reach you so that I can contact the winner. There's also an entry for posting about the giveaway on your blog/site, but that's totally optional. This giveaway will be open for 2 weeks, after which I'll email the winner. S/he will have 48 hours to respond, or another winner will be chosen. I can't take responsibility for you receiving the email, so be sure to check your spam folder. I'll also post the winner's name here on DMN. More boilerplate, please have a parent's permission to enter if you're under 18 because I'll need a full name and address for mailing out the swag. If I think of anything I missed, I'll be sure to add it here, but that's probably enough blah blah blah...time for the widget! Thank you again, so very much, for visiting Did My Nails! The TT theme today is our oldest polish, and I have a tie on my hands (ugh, that is such a horrible, unintentional pun, but imma leave it. forgive me.). Five and a half years ago I wasn't that into nail polish. I wore acrylics for a while, then switched to gel, so the few polishes I owned then didn't make the journey with us when we moved to the other side of the planet. Once I realised I wanted to change my nails more often than my gels needed, though, I started collecting polishes of my own again, slowly at first, until it exploded into the full-blown and no doubt healthy obsession it is today. The first polishes I picked up, maybe four and a half years ago, were from the drugstore downstairs, and the only polishes they had then were by a brand called Australis. I grabbed the two brightest ones I saw, which turned out to be foils (not that I knew what that was), and since they tie for my oldest polish I decided to wear them together as a gradient. I'd forgotten how incredibly brilliant these colours are! The orange on my tips is called Orange Crystals, and the pink is...I couldn't even guess, other than maybe Pink Crystals, because the label is long gone. 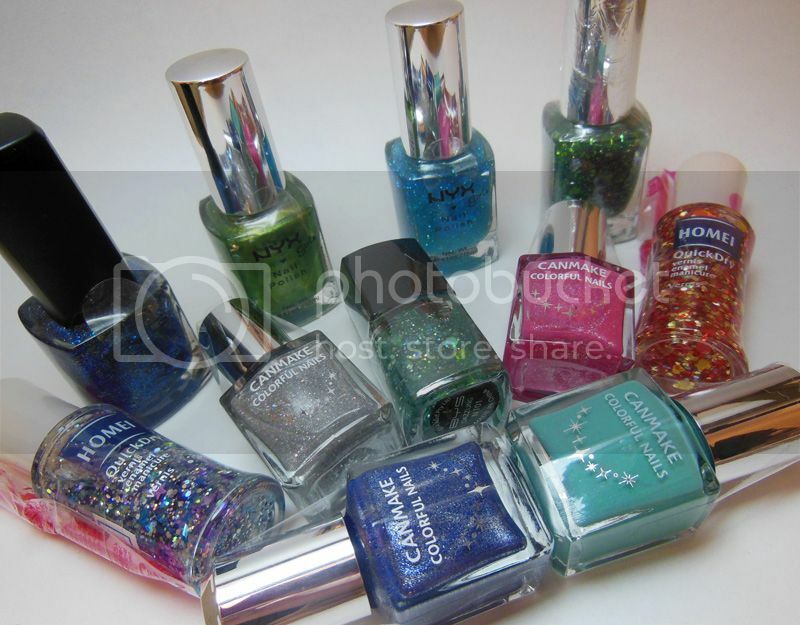 And checking the Australis website didn't help; their polishes don't even come in the same bottles anymore. I expect both of these to find their way back into my ever-expanding rotation, but I don't see myself doing a gradient with them again. First, because I'd forgotten just what a pain cleaning up a foil gradient can be, and second, because while I love this manicure to pieces close-up, the orange and pink actually blended into each other so smoothly that just from an arm's length away I can't even tell they're two separate colours anymore. Still, I was definitely impressed at how well these applied. Very even first coat that built up nicely, and the sparkle off these foils is amazing. Would totally try Australis again. Memory Lane was a pretty short stroll for me. I'm betting some of other Twinsies' polishes date back a whole lot farther! Ein prosit! Now that November is almost over, I'm finally posting my Oktoberfest nail art! 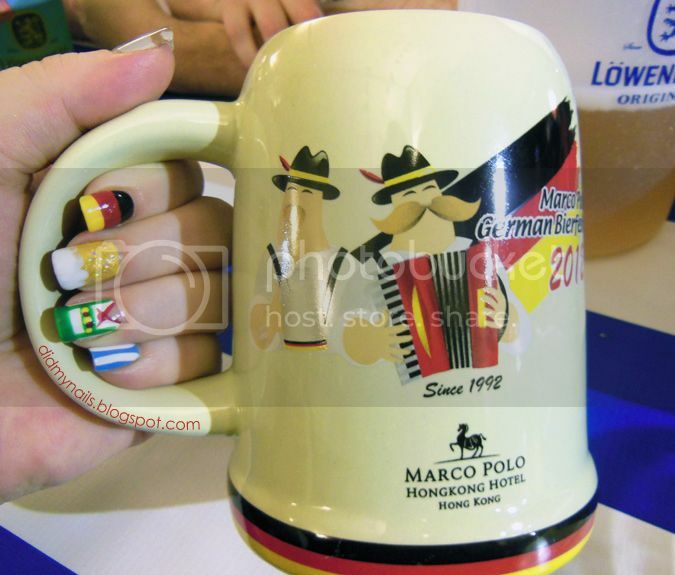 We actually did go in November, though--back on Saturday the 3rd--to the German Bierfest at the Marco Polo Hotel, here in Hong Kong. Glasses were raised, chickens were danced, friends were made from Japan and Australia, and nails were painted for what has been an annual tradition since we moved here. My thumbs were OPI San Tan-tonio pretzels dotted over Zoya Dove, with Orly Shine On Crazy Diamond "salt" on top. 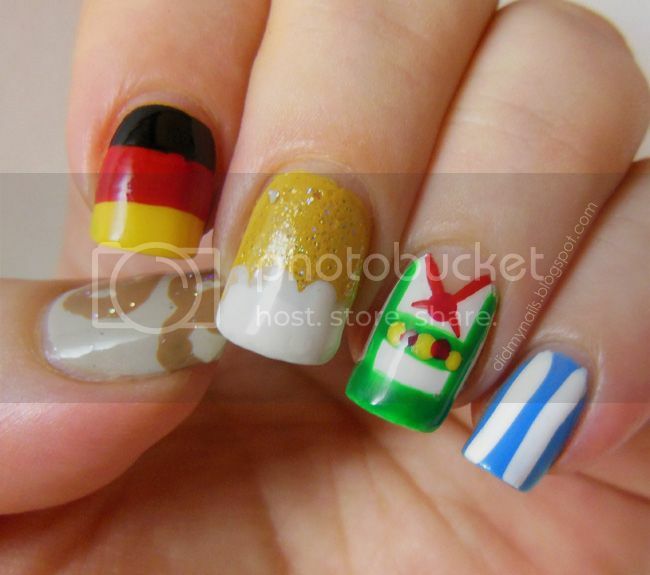 The German flags on my index fingers are a simple tape block of OPI Need Sunglasses?, Revlon Fire, and China Glaze Liquid Leather. The middle fingers are my favourite, even if I probably should have done them the other way up. Whatever, hooray for beer nails! The amber yellow is Jaune trendy by Bourjois, with glitter Revlon Gold Jewels "bubbles" over it. The tips are dotted with both OPI My Boyfriend Scales Walls and China Glaze White On White. Already looking forward to next year...eins, zwei, g'suffa!! I met Rachel Read through her blog, Through The Looking Glass, where she blogs about beauty and nails, good eats, and life in Hong Kong. She's also the editor of local lifestyle website Sassy Hong Kong, and when she asked if I would write a tutorial for them on moustache nails in honour of Movember, I was thrilled to accept! And also really, really nervous because I am far from an expert. Fortunately, Rach is far too classy to mock my shortcomings, and the resulting article is now running here: Movember Mani -- our easy how-to guide. She also encouraged me to feel free to post it here as well, so if you're interested in having a peek, there's a slightly edited version after the break! Since I'd already done a bit of nail art this week I decided that for actual Thanksgiving I'd wear Apple Crisp, by Darling Diva Polish, over Revlon Muse. I love the mix of glitters in Apple Crisp! 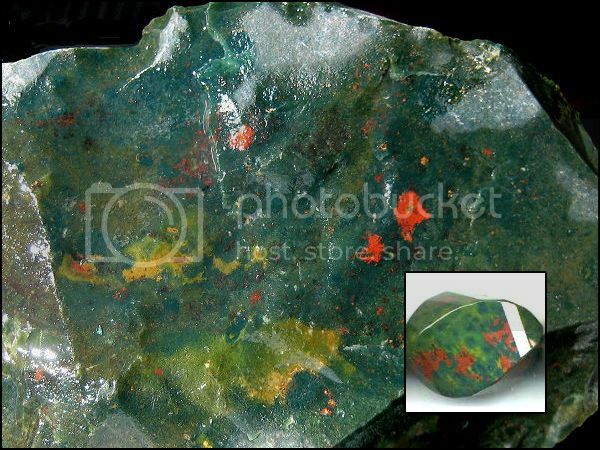 There's green, red, brown, and translucent white in several shapes and sizes. The larger glitters are matte, but the smaller ones have so much sparkle! This is also is the first scented polish that I've actually enjoyed. Apple Crisp is infused with a vanilla sugar scent that, a day later, still smells warm and delicious. How cute are those large, red "apple" pieces?! And I love the balance of the bold, pretty brown and the soft, translucent white. Apple Crisp applied smoothly, with a good consistency. I'm wearing two coats here, with just a little bit of extra dabbing to fill out a couple of spots. I used two top coats, one of Gelous, followed by Seche Vite, and everything was smooth. I have a couple more polishes from Darling Diva to try soon, and if they wear anything like Apple Crisp, I expect to be very, very happy.